Eclipse is one of the industry’s leading platforms for microwave access, transport and backhaul applications and has been proven in network deployments all over the world for a wide variety of applications. Eclipse provides the most comprehensive wireless solution available for transport of all types of traffic, from low-capacity PDH to high-capacity SDH/SONET to Carrier Ethernet. Eclipse was the first platform to introduce the market’s most innovative features, such as Super-PDH™ capacity migration, advanced nodal networking and Liquid Bandwidth assignment of available radio capacity between TDM and Ethernet traffic, all to deliver high-end performance at lower overall cost of ownership. With proven performance under the most rugged conditions, Eclipse leads the way in supporting efficient and scalable wireless networks. Software-scalable capacity migration enables easy adaptation to changing conditions and future needs. Broad licensed frequency band support. 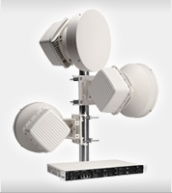 Optimised nodal solution supports multiple radio paths with built-in traffic routing, add-and-drop and aggregation. Unique Super-PDH networking provides a simple and cost-effective alternative to SDH/SONET.